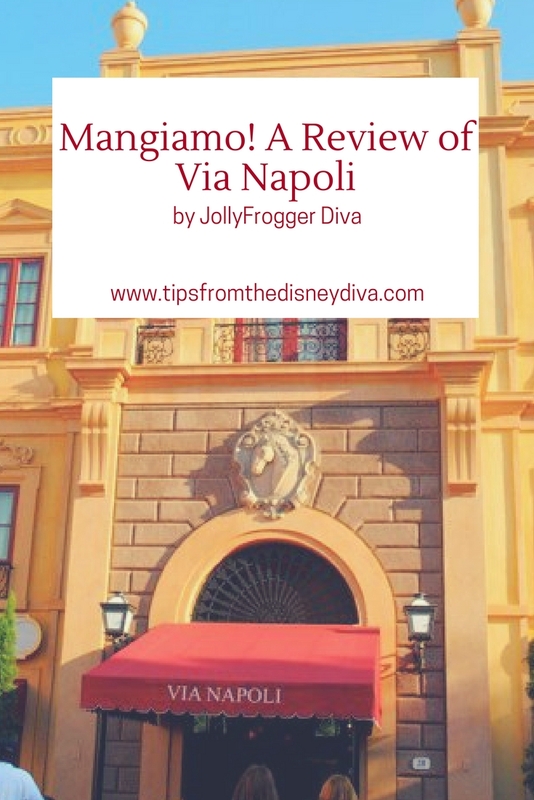 My family loves to visit during Epcot’s International Food & Wine Festival so we generally don’t make many table service reservations for our days at Epcot (you can read Passholder Diva’s tips for Food & Wine Festival here). 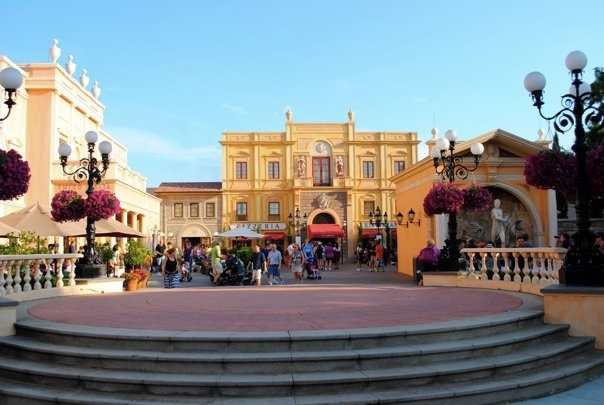 There is one exception, however – we always save time to enjoy a meal at Via Napoli, located at the Italy Pavilion in World Showcase. We’ve been dining here every trip since 2011, and it’s a meal we all look forward to. 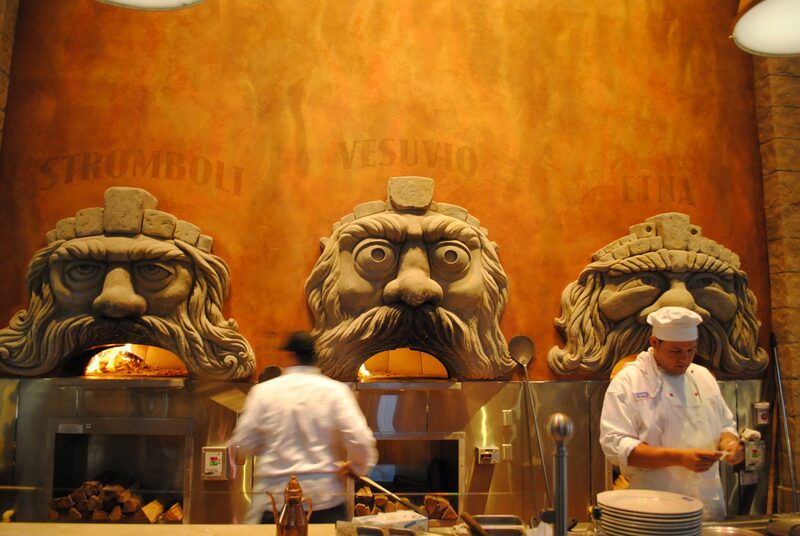 One of the most charming parts of Via Napoli is their three brick ovens, each of which has a face and a name (Stromboli, Vesuvio, and Etna). I love the creativity they used to dress up the most vital part of the kitchen. 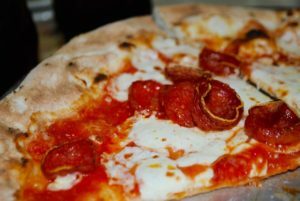 Vesuvio and Etna are named after 2 of Italy’s volcanoes while Stromboli is well-known Italian food. On our last visit, we were seated on the opposite side of the restaurant from the ovens, in a room that resembles an enclosed patio. I wasn’t a huge fan of this particular room- it was loud and echoed and didn’t lend to conversation very well. 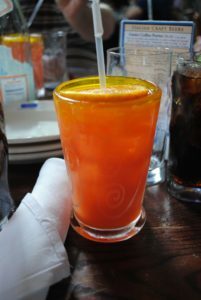 The restaurant was definitely full, but we received our drinks and placed our order in a reasonable amount of time. 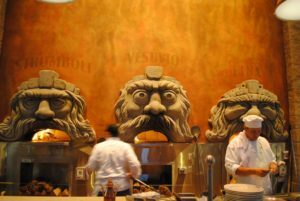 When you order at Via Napoli, there are 2 separate kitchens- 1 that focuses on pizzas, and 1 that focuses on everything else. Our server let us know that due to having 2 kitchens, our order might not come out all at the same time. 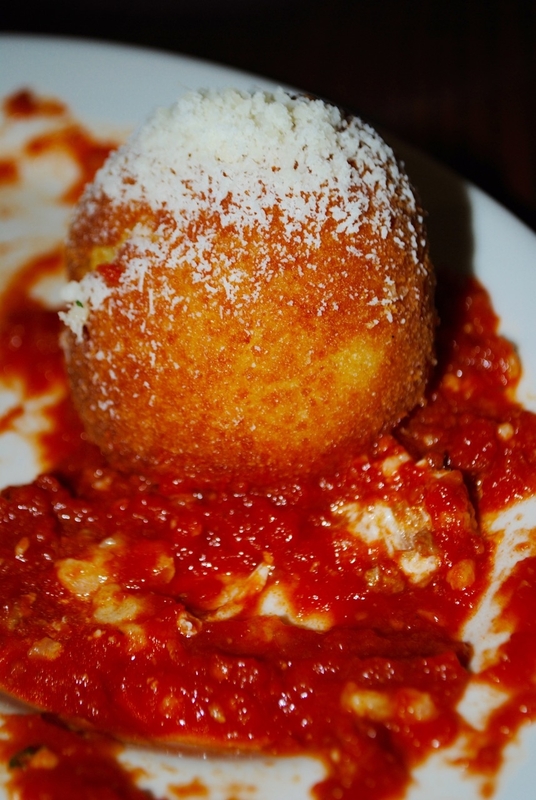 We started our meal with an order of the arancini, which are balls of fried risotto filled with cheese and served with marinara to dip them in. We had ordered these on previous visits, and they were as delicious as I remembered them to be. I also ordered the blood orange aqua fresca, which is blood orange juice blended with sugar and water to create a delicious, refreshing drink. They also have a strawberry aqua fresca, but I love blood orange so that’s the flavor I always order. When they told us that the non pizza entrees might come out before the pizza entrees, we weren’t concerned. 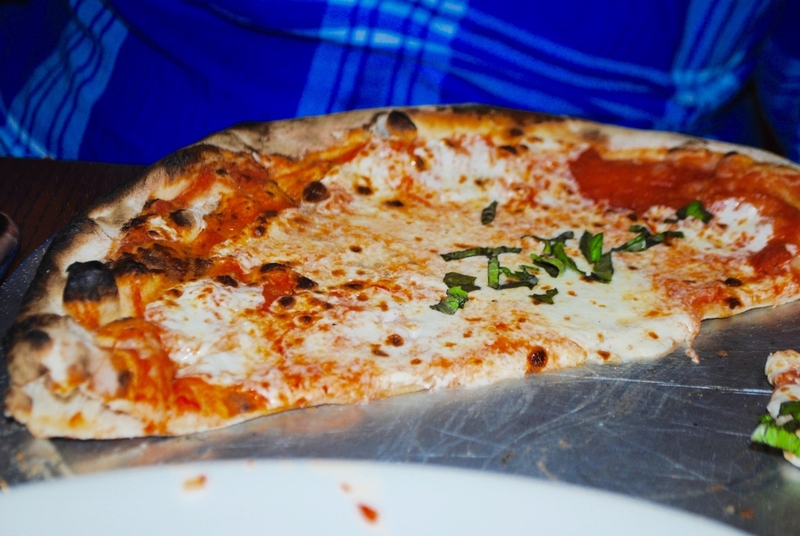 However, the pizza side of the kitchen must have been very busy that night because our non pizza entrees have been delivered and almost completely eaten before our pizzas arrived. My daughter ordered the spaghetti, so fortunately we didn’t have a hungry kid meltdown. 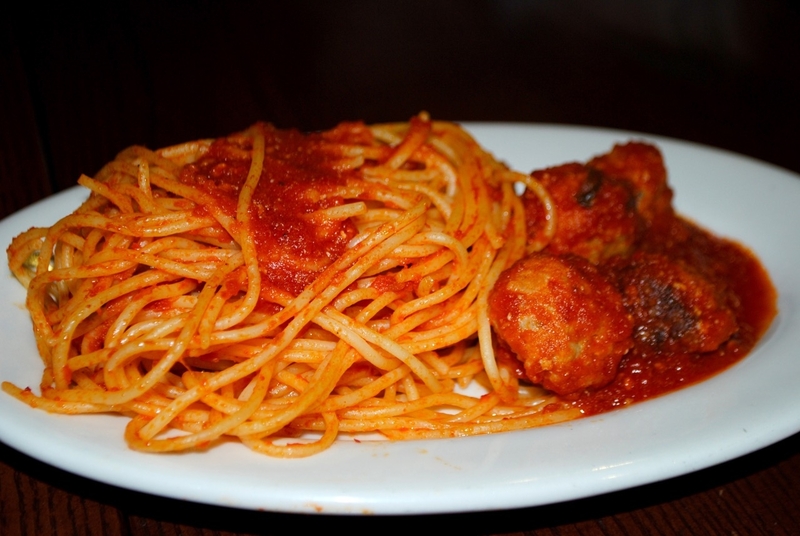 Her spaghetti was generous in size and got the toddler seal of approval. My father also ordered pasta and my sister ordered the chicken parmesan. 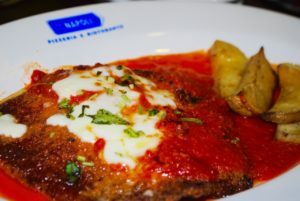 The chicken parmesan was delicious- golden brown and crispy on the outside, but still moist on the inside. The pizza finally arrived and was, in my opinion, worth the wait. 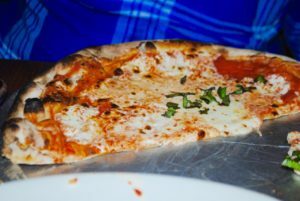 It was cheesy and gooey on top, and the crust had that delicious wood-fired flavor without being burnt. Definitely my favorite place to eat pizza on Disney property. I got the quattro formaggi, my husband got the pepperoni, and my mom got the margherita. We all of us got the individual size. The portion was generous and we even took some back to the hotel room with us to snack on later. 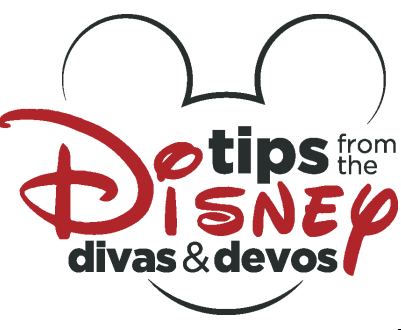 Although we were pretty full from our meal, one of the perks of being on the Disney Dining Plan is that desert is included with your meal (check out Pixie Dusted Diva’s tips for using the dining plan here). 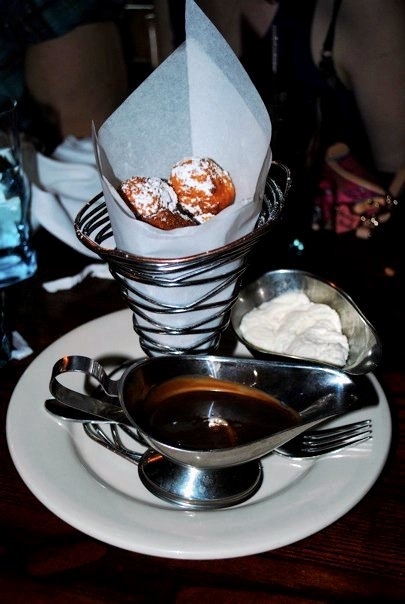 I chose the Zeppole, which are fried ricotta cheese fritters served with homemade whipped cream and chocolate dipping sauce. 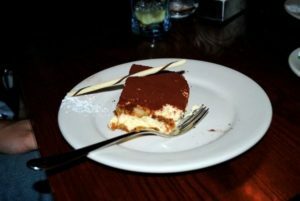 My husband is a huge fan of Tiramisu so he couldn’t pass up the opportunity to order that. The Zeppole were delicious- light and fluffy and made even more delicious by the chocolate sauce, which wasn’t too sweet and a nice complement. I ate most of the fresh whipped cream by itself because it was so good. My husband loved his Tiramisu- it was moist, flavorful, and everything he hoped for. Both desserts were a perfect finish to a delicious meal. In the end, despite the long wait for food and the noisy room, our meal at Via Napoli was everything we hoped for- delicious food and time spent with one another. We will definitely visit again on our next trip, although we’ll probably allow a bigger time slot since the service seemed to be so slow. Need help planning your next trip or just want a free quote? Contact Patricia at All for Dream Travel here.